Cassock (Anteri) in black Marocain 100% synthetic fabric with a hook-and-eye on the front of the neck and a reversible double-button closure. Cassock (Anteri) in dark blue Marocain 100% synthetic fabric with a hook-and-eye on the front of the neck and a reversible double-button closure. Cassock (Anteri) in Grey Marocain 100% synthetic fabric with a hook-and-eye on the front of the neck and a reversible double-button closure. Cassock (Anteri) in white Marocain 100% synthetic fabric with a hook-and-eye on the front of the neck and a reversible double-button closure. Cassock (Anteri) in purple Marocain 100% synthetic fabric with a hook-and-eye on the front of the neck and a reversible double-button closure. Cassock (Anteri) in black Marocain 100% synthetic fabric with a slightly rounded collar that fastens with a hook-and-eye on the front of the neck. Cassock (Anteri) in dark blue Marocain 100% synthetic fabric with a slightly rounded collar that fastens with a hook-and-eye on the front of the neck. 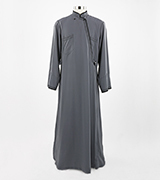 Cassock (Anteri) in grey Marocain 100% synthetic fabric with a slightly rounded collar that fastens with a hook-and-eye on the front of the neck. Cassock (Anteri) in white Marocain 100% synthetic fabric with a slightly rounded collar that fastens with a hook-and-eye on the front of the neck. Cassock (Anteri) in black Marocain 100% synthetic fabric with collar that fastens with two buttons on the front of the neck. 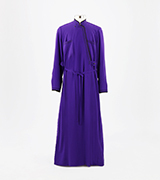 Cassock (Anteri) in purple Marocain 100% synthetic fabric with a slightly rounded collar that fastens with a hook-and-eye on the front of the neck. Cassock (Anteri) in dark blue Marocain 100% synthetic fabric with two buttons on the front of the neck. 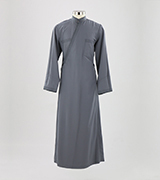 Cassock (Anteri) in grey Marocain 100% synthetic fabric with two buttons on the front of the neck. Cassock (Anteri) in white Marocain 100% synthetic fabric with two buttons on the front of the neck. Cassock (Anteri) in purple Marocain 100% synthetic fabric with two buttons on the front of the neck. Cassock (Anteri) with decorative trim in black Marocain 100% synthetic fabric with a hook-and-eye on the front of the neck and a reversible double-button closure. Cassock (Anteri) with decorative trim in dark blue Marocain 100% synthetic fabric with a hook-and-eye on the front of the neck and a reversible double-button closure. Cassock (Anteri) with decorative trim in grey Marocain 100% synthetic fabric with a hook-and-eye on the front of the neck and a reversible double-button closure. Premium Cassock (Anteri) in Marocain 100% synthetic fabric, white color. Cassock (Anteri) with decorative trim in purple Marocain 100% synthetic fabric with a hook-and-eye on the front of the neck and a reversible double-button closure. Cassock (Anteri) with decorative trim in dark blue Marocain 100% synthetic fabric with a slightly rounded collar that fastens with a hook-and-eye on the front of the neck. Cassock (Anteri) with decorative trim in grey Marocain 100% synthetic fabric with a slightly rounded collar that fastens with a hook-and-eye on the front of the neck. Cassock (Anteri) with decorative trim in white Marocain 100% synthetic fabric with a slightly rounded collar that fastens with a hook-and-eye on the front of the neck. Cassock (Anteri) with decorative trim in purple Marocain 100% synthetic fabric with a slightly rounded collar that fastens with a hook-and-eye on the front of the neck. Cassock (Anteri) with decorative trim in black Marocain 100% synthetic fabric with two buttons on the collar on the front of the neck. Cassock (Anteri) with decorative trim in dark blue Marocain 100% synthetic fabric with two buttons on the collar on the front of the neck. Cassock (Anteri) with decorative trim in grey Marocain 100% synthetic fabric with two buttons on the collar on the front of the neck. Cassock (Anteri) with decorative trim in white Marocain 100% synthetic fabric with two buttons on the collar on the front of the neck. Cassock (Anteri) with decorative trim in purple Marocain 100% synthetic fabric with two buttons on the collar on the front of the neck. Cassock (Anteri) in black Crepe Marocain 100% synthetic fabric with a hook-and-eye on the front of the neck and a reversible double-button closure. Cassock (Anteri) in dark blue Crepe Marocain 100% synthetic fabric with a hook-and-eye on the front of the neck and a reversible double-button closure. Cassock (Anteri) in Grey Crepe Marocain 100% synthetic fabric with a hook-and-eye on the front of the neck and a reversible double-button closure. Cassock (Anteri) in white Crepe Marocain 100% synthetic fabric with a hook-and-eye on the front of the neck and a reversible double-button closure. Cassock (Anteri) in burgundy Crepe Marocain 100% synthetic fabric with a hook-and-eye on the front of the neck and a reversible double-button closure. Cassock (Anteri) in black Crepe Marocain 100% synthetic fabric with a slightly rounded collar that fastens with a hook-and-eye on the front of the neck. Cassock (Anteri) in dark blue Crepe Marocain 100% synthetic fabric with a slightly rounded collar that fastens with a hook-and-eye on the front of the neck. Cassock (Anteri) in grey Crepe Marocain 100% synthetic fabric with a slightly rounded collar that fastens with a hook-and-eye on the front of the neck. Cassock (Anteri) in white Crepe Marocain 100% synthetic fabric with a slightly rounded collar that fastens with a hook-and-eye on the front of the neck. Cassock (Anteri) in burgundy Crepe Marocain 100% synthetic fabric with a slightly rounded collar that fastens with a hook-and-eye on the front of the neck. Cassock (Anteri) in black Crepe Marocain 100% synthetic fabric with collar that fastens with two buttons on the front of the neck. Cassock (Anteri) in dark blue Crepe Marocain 100% synthetic fabric with two buttons on the front of the neck. 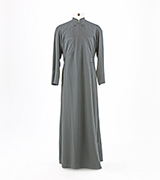 Cassock (Anteri) in grey Crepe Marocain 100% synthetic fabric with two buttons on the front of the neck. Cassock (Anteri) in white Crepe Marocain 100% synthetic fabric with two buttons on the front of the neck. Cassock (Anteri) in Burgundy Crepe Marocain 100% synthetic fabric with two buttons on the front of the neck. Cassock (Anteri) with decorative trim in black Crepe Marocain 100% synthetic fabric with a hook-and-eye on the front of the neck and a reversible double-button closure. Cassock (Anteri) with decorative trim in dark blue Crepe Marocain 100% synthetic fabric with a hook-and-eye on the front of the neck and a reversible double-button closure. Cassock (Anteri) with decorative trim in grey Crepe Marocain 100% synthetic fabric with a hook-and-eye on the front of the neck and a reversible double-button closure. Cassock (Anteri) with decorative trim in white Crepe Marocain 100% synthetic fabric with a hook-and-eye on the front of the neck and a reversible double-button closure. Cassock (Anteri) with decorative trim in Burgundy Crepe Marocain 100% synthetic fabric with a hook-and-eye on the front of the neck and a reversible double-button closure. Cassock (Anteri) with decorative trim in dark blue Crepe Marocain 100% synthetic fabric with a slightly rounded collar that fastens with a hook-and-eye on the front of the neck. Cassock (Anteri) with decorative trim in grey Crepe Marocain 100% synthetic fabric with a slightly rounded collar that fastens with a hook-and-eye on the front of the neck. Cassock (Anteri) with decorative trim in white Crepe Marocain 100% synthetic fabric with a slightly rounded collar that fastens with a hook-and-eye on the front of the neck. Cassock (Anteri) with decorative trim in Burgundy Crepe Marocain 100% synthetic fabric with a slightly rounded collar that fastens with a hook-and-eye on the front of the neck. Cassock (Anteri) with decorative trim in black Crepe Marocain 100% synthetic fabric with two buttons on the collar on the front of the neck. Cassock (Anteri) with decorative trim in dark blue Crepe Marocain 100% synthetic fabric with two buttons on the collar on the front of the neck. Cassock (Anteri) with decorative trim in grey Crepe Marocain 100% synthetic fabric with two buttons on the collar on the front of the neck. Cassock (Anteri) with decorative trim in white Crepe Marocain 100% synthetic fabric with two buttons on the collar on the front of the neck. Cassock (Anteri) with decorative trim in Burgundy Crepe Marocain 100% synthetic fabric with two buttons on the collar on the front of the neck. Cassock (Anteri) in black Poplin 100% Cotton fabric with a hook-and-eye on the front of the neck and a reversible double-button closure. Cassock (Anteri) in blue Poplin 100% Cotton fabric with a hook-and-eye on the front of the neck and a reversible double-button closure. Cassock (Anteri) in black Poplin 100% Cotton fabric with a slightly rounded collar that fastens with a hook-and-eye on the front of the neck. Cassock (Anteri) in Poplin 100% Cotton fabric, blue color with a slightly rounded collar that fastens with a hook-and-eye on the front of the neck. Cassock (Anteri) in black Poplin 100% Cotton fabric with two buttons on the collar on the front of the neck. Cassock (Anteri) in blue Poplin 100% Cotton fabric with two buttons on the collar on the front of the neck. Cassock (Anteri) with decorative trim in black Poplin 100% Cotton fabric with a hook-and-eye on the front of the neck and a reversible double-button closure. Cassock (Anteri) with decorative trim in blue Poplin 100% Cotton fabric with a hook-and-eye on the front of the neck and a reversible double-button closure. Cassock (Anteri) with decorative trim in black Poplin 100% Cotton fabric with a slightly rounded collar that fastens with a hook-and-eye on the front of the neck. Cassock (Anteri) with decorative trim in blue Poplin 100% Cotton fabric with a slightly rounded collar that fastens with a hook-and-eye on the front of the neck. Cassock (Anteri) with decorative trim in black Poplin 100% Cotton fabric with two buttons on the collar on the front of the neck. Cassock (Anteri) with decorative trim in blue Poplin 100% Cotton fabric with two buttons on the collar on the front of the neck. Cassock (Anteri) in black Poplin Blend (65% synthetic- 35% cotton) with a hook-and-eye on the front of the neck and a reversible double-button closure. Cassock (Anteri) in blue Poplin Blend (65% synthetic- 35% cotton) with a hook-and-eye on the front of the neck and a reversible double-button closure. Cassock (Anteri) in Grey Poplin Blend (65% synthetic- 35% cotton) with a hook-and-eye on the front of the neck and a reversible double-button closure. Cassock (Anteri) in black Poplin Blend (65% synthetic- 35% cotton) with a slightly rounded collar that fastens with a hook-and-eye on the front of the neck. Cassock (Anteri) in blue Poplin Blend (65% synthetic- 35% cotton) with a slightly rounded collar that fastens with a hook-and-eye on the front of the neck. 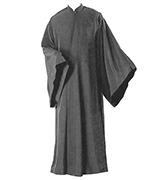 Cassock (Anteri) in Grey Poplin Blend (65% synthetic- 35% cotton) with a slightly rounded collar that fastens with a hook-and-eye on the front of the neck. Cassock (Anteri) in black Poplin Blend (65% synthetic- 35% cotton) with two buttons on the collar on the front of the neck. Cassock (Anteri) in blue Poplin Blend (65% synthetic- 35% cotton) with two buttons on the collar on the front of the neck. Cassock (Anteri) in Grey Poplin Blend (65% synthetic- 35% cotton) with two buttons on the collar on the front of the neck. Cassock (Anteri) with decorative trim in black Poplin Blend (65% synthetic- 35% cotton) with a hook-and-eye on the front of the neck and a reversible double-button closure. Cassock (Anteri) with decorative trim in blue Poplin Blend (65% synthetic- 35% cotton) with a hook-and-eye on the front of the neck and a reversible double-button closure. Cassock (Anteri) with decorative trim in Grey Poplin Blend (65% synthetic- 35% cotton) with a hook-and-eye on the front of the neck and a reversible double-button closure. Cassock (Anteri) with decorative trim in black Poplin Blend (65% synthetic- 35% cotton) with a slightly rounded collar that fastens with a hook-and-eye on the front of the neck. Cassock (Anteri) with decorative trim in blue Poplin Blend (65% synthetic- 35% cotton) with a slightly rounded collar that fastens with a hook-and-eye on the front of the neck. Cassock (Anteri) with decorative trim in Grey Poplin Blend (65% synthetic- 35% cotton) with a slightly rounded collar that fastens with a hook-and-eye on the front of the neck. Cassock (Anteri) with decorative trim in black Poplin Blend (65% synthetic- 35% cotton) with two buttons on the collar on the front of the neck. Cassock (Anteri) with decorative trim in blue Poplin Blend (65% synthetic- 35% cotton) with two buttons on the collar on the front of the neck. Cassock (Anteri) with decorative trim in Grey Poplin Blend (65% synthetic- 35% cotton) with two buttons on the collar on the front of the neck. Cassock (Anteri) in black Wool Blend fabric (60% Wool - 40% Synthetic) with a hook-and-eye on the front of the neck and a reversible double-button closure. Cassock (Anteri) in blue Wool Blend fabric (60% Wool - 40% Synthetic) with a hook-and-eye on the front of the neck and a reversible double-button closure. Cassock (Anteri) in black Wool Blend fabric (60% Wool - 40% Synthetic) with a slightly rounded collar that fastens with a hook-and-eye on the front of the neck. Cassock (Anteri) in Blue Wool Blend fabric (60% Wool - 40% Synthetic) with a slightly rounded collar that fastens with a hook-and-eye on the front of the neck. Cassock (Anteri) in black Wool Blend fabric (60% Wool - 40% Synthetic) with two buttons on the collar on the front of the neck. Cassock (Anteri) in blue Wool Blend fabric (60% Wool - 40% Synthetic) with two buttons on the collar on the front of the neck. Cassock (Anteri) with decorative trim in black Wool Blend fabric (60% Wool - 40% Synthetic) with a hook-and-eye on the front of the neck and a reversible double-button closure. Cassock (Anteri) with decorative trim in blue Wool Blend fabric (60% Wool - 40% Synthetic) with a hook-and-eye on the front of the neck and a reversible double-button closure. Cassock (Anteri) with decorative trim in black Wool Blend fabric (60% Wool - 40% Synthetic) with a slightly rounded collar that fastens with a hook-and-eye on the front of the neck. Cassock (Anteri) with decorative trim in blue Wool Blend fabric (60% Wool - 40% Synthetic) with a slightly rounded collar that fastens with a hook-and-eye on the front of the neck. Cassock (Anteri) with decorative trim in black Wool Blend fabric (60% Wool - 40% Synthetic) with two buttons on the collar on the front of the neck. Cassock (Anteri) with decorative trim in blue Wool Blend fabric (60% Wool - 40% Synthetic) with two buttons on the collar on the front of the neck. Cassock (Anteri) in black Silk and synthetic fabric with a hook-and-eye on the front of the neck and a reversible double-button closure. Cassock (Anteri) in black Silk and synthetic fabric with a slightly rounded collar that fastens with a hook-and-eye on the front of the neck. Cassock (Anteri) in black Silk and synthetic with two buttons on the collar on the front of the neck. Cassock (Anteri) in black Silk and synthetic fabric with decorative trim and with a hook-and-eye on the front of the neck and a reversible double-button closure. 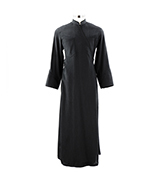 Cassock (Anteri) in black Silk and synthetic fabric with decorative trim and with a slightly rounded collar that fastens with a hook-and-eye on the front of the neck. Cassock (Anteri) in black Silk and synthetic fabric with decorative trim and with two buttons on the collar on the front of the neck. Cassock (Anteri) in black Gofre 100% synthetic fabric with a hook-and-eye on the front of the neck and a reversible double-button closure. Cassock (Anteri) in dark blue Gofre 100% synthetic fabric with a hook-and-eye on the front of the neck and a reversible double-button closure. Cassock (Anteri) in Grey Gofre 100% synthetic fabric with a hook-and-eye on the front of the neck and a reversible double-button closure. Cassock (Anteri) in black Gofre 100% synthetic fabric with a slightly rounded collar that fastens with a hook-and-eye on the front of the neck. Cassock (Anteri) in dark blue Gofre 100% synthetic fabric with a slightly rounded collar that fastens with a hook-and-eye on the front of the neck. Cassock (Anteri) in grey Gofre 100% synthetic fabric with a slightly rounded collar that fastens with a hook-and-eye on the front of the neck. Cassock (Anteri) in black Gofre 100% synthetic fabric with collar that fastens with two buttons on the front of the neck. Cassock (Anteri) in dark blue Gofre 100% synthetic fabric with two buttons on the front of the neck. 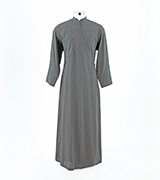 Cassock (Anteri) in grey Gofre 100% synthetic fabric with two buttons on the front of the neck. Cassock (Anteri) with decorative trim in black Gofre 100% synthetic fabric with a hook-and-eye on the front of the neck and a reversible double-button closure. Cassock (Anteri) with decorative trim in dark blue Gofre 100% synthetic fabric with a hook-and-eye on the front of the neck and a reversible double-button closure. Cassock (Anteri) with decorative trim in grey Gofre 100% synthetic fabric with a hook-and-eye on the front of the neck and a reversible double-button closure. Cassock (Anteri) with decorative trim in dark blue Gofre 100% synthetic fabric with a slightly rounded collar that fastens with a hook-and-eye on the front of the neck. Cassock (Anteri) with decorative trim in grey Gofre 100% synthetic fabric with a slightly rounded collar that fastens with a hook-and-eye on the front of the neck. Cassock (Anteri) with decorative trim in black Gofre 100% synthetic fabric with two buttons on the collar on the front of the neck. Cassock (Anteri) with decorative trim in dark blue Gofre 100% synthetic fabric with two buttons on the collar on the front of the neck. Cassock (Anteri) with decorative trim in grey Gofre 100% synthetic fabric with two buttons on the collar on the front of the neck. Cassock (Anteri) in black Mohair Wool (100% Natural) fabric with a hook-and-eye on the front of the neck and a reversible double-button closure. Cassock (Anteri) in black Mohair Wool (100% Natural) fabric with a slightly rounded collar that fastens with a hook-and-eye on the front of the neck. 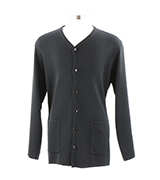 Cassock (Anteri) in black Mohair Wool (100% Natural) fabric with two buttons on the collar on the front of the neck. Cassock (Anteri) with decorative trim in black Mohair Wool (100% Natural) fabric with a hook-and-eye on the front of the neck and a reversible double-button closure. Cassock (Anteri) with decorative trim in black Mohair Wool (100% Natural) fabric with a slightly rounded collar that fastens with a hook-and-eye on the front of the neck. Cassock (Anteri) with decorative trim in black Mohair Wool (100% Natural) fabric with two buttons on the collar on the front of the neck. Exoraso (outer) in Marocain 100% synthetic fabric, black color. Exoraso (outer) in Marocain 100% synthetic fabric, grey color. Exoraso (outer) in Crepe Marocain 100% synthetic fabric, black color. Exoraso (outer) in Crepe Marocain 100% synthetic fabric, grey color. Exoraso (outer) in Poplin 100% Cotton fabric, black color. Exoraso (outer) in Poplin Cotton Blend (65% Synthetic - 35% Cotton) fabric, black color. Exoraso (outer) in Wool Blend fabric (60% Wool - 40% Synthetic),black color. Exoraso (outer) in 100% Silk fabric, black color. Exoraso (outer) in Silk and Synthetic fabric, black color. Exoraso (outer) in Mohair wool (100% natural),black color. Black knitted jacket with button-down front. Kontoraso with collar in Marocain 100% synthetic fabric, black color. Kontoraso with collar in Marocain 100% synthetic fabric, blue color. Kontoraso with collar in Marocain 100% synthetic fabric, grey color. Kontoraso with collar in Crepe Marocain 100% synthetic fabric, black color. Kontoraso with collar in Crepe Marocain 100% synthetic fabric, blue color. Kontoraso with collar in Crepe Marocain 100% synthetic fabric, grey color. Kontoraso with collar in Poplin 100% Cotton fabric, black color. Kontoraso with collar in Poplin Cotton Blend (65% Synthetic - 35% Cotton) fabric, black color. Kontoraso with collar in Wool Blend fabric (60% Wool - 40% Synthetic), black color. Kontoraso with collar in 100% Silk fabric, black color. Kontoraso with collar in Silk and Synthetic fabric, black color. Sleeveless Vest in Marocain 100% synthetic fabric, black color. Sleeveless Vest in Marocain 100% synthetic fabric, blue color. Sleeveless Vest in Marocain 100% synthetic fabric, grey color. Sleeveless Vest in Crepe Marocain 100% synthetic fabric, black color. Sleeveless Vest in Crepe Marocain 100% synthetic fabric, blue color. Sleeveless Vest in Crepe Marocain 100% synthetic fabric, grey color. Sleeveless Vest in Poplin 100% Cotton fabric, black color. 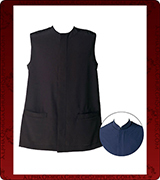 Sleeveless Vest in Poplin Cotton Blend (65% Synthetic - 35% Cotton) fabric, black color. Sleeveless Vest in Wool Blend fabric (60% Wool - 40% Synthetic), black color. Sleeveless Vest in Silk and Synthetic fabric, black color.